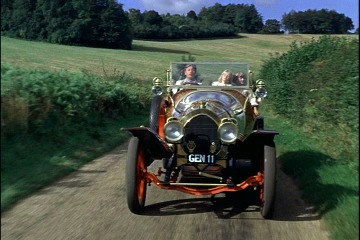 Chitty Chitty Bang Bang was one of my favorite films as a child and with this in mind I purchased the DVD version. The lengthy film revolves around Caractacus Potts, a widower inventor who spends more time on his crazy inventions than paying attention to his children. However, when his kids plead with him to save an old race car destined for the scrap heap he scrounges up the cash, buys it, and sets to fixing it up. What he produces is truly amazing. A fun-filled adventure ensues involving the child-hating Baron Bomburst who will stop at nothing to have the car – including kidnapping the inventor. Who could have thought that Ian Fleming, the man behind 007, could have written this wonderful children’s film? The film has been treated to a deluxe THX restoration that probably looks better than the original ever did. While some folks may object to the Pan & Scan formatting, MGM probably felt this title appeals more to the younger crowd who wouldn’t appreciate the finer details of a widescreen presentation. 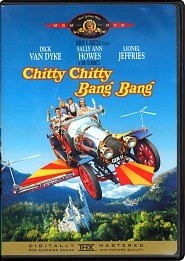 Comparing this new version to the original VHS release, the DVD at least opted to include the opening credits in widescreen instead of the "squished" effect produced on tape. Overall framing seems much better as well, with more visible picture. In one opening scene an A/B test on both versions shows the DVD actually gains about 10% more picture on both the top and left sides, improving composition on some scenes that originally appeared cramped. The picture quality is simply stunning. After watching the VHS tape for fifteen minutes I had to turn it off – there was very little color anywhere, and what was there was a blurry brown and white. It was completely devoid of richness and was much too contrasty. The DVD on the other hand looks as good as the best of them. Incredible greens, deep blues and reds that were completely missing on the tape are all faithfully reproduced here. Sharpness is excellent with plenty of detail and little grain. I didn’t experience any pixelation or artifacts and the print used is remarkably free of defects considering its age. The disc is dual layered and holds a total of 7.88gb. 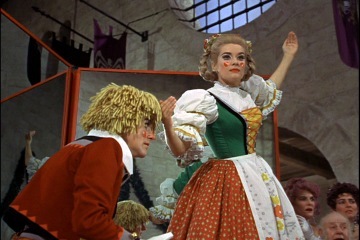 In addition to a vibrant visual restoration, MGM has chosen to re-master Chitty with a brand-new 5.1 soundtrack. Audio is much improved, with more range and a wider stage. Voices no longer grate on your ears and you can finally pick single instruments out of the orchestra. The rear channels aren’t used much, and though it doesn’t have the dynamic sonic range of newer titles I still feel they’ve done a great job with what was available. Extras are slim but do include a short booklet with trivia facts, the original theatrical trailer, fully animated menus and a karaoke Sing-Along feature that prompts kids on 13 songs. The list price of $24.99 is standard for MGM titles and well worth it in this case. For anyone who enjoys this movie or has a family member that does this DVD comes highly recommended. - Reviewed by Daniel Tonks on May 5, 1999.